Rediff.com » News » Stop these attacks on Kashmiris! 'It is as if for some of our political figures and misguided youth, Kashmir is a piece of real estate over which we assert our claim, but the people there are dispensable,' notes former foreign secretary Shyam Saran. 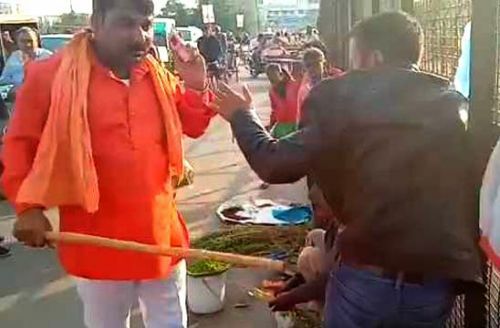 IMAGE: Kashmiri vendors selling dry fruit were thrashed by a group of hoodlums in Daliganj, Lucknow, March 6, 2019 in an incident that has become all too common in India. Post-Pulwama developments in Kashmir are deeply disturbing. The fact that the terrorist attack on the Central Reserve Police Force convoy was carried out by a local Kashmiri youth should lead to honest introspection among all right-thinking Indians. What deep resentment and frustration could have led an otherwise normal and educated Kashmiri boy to take this extreme step? Even if we believe that he was led astray by evil forces across the border, what made him receptive to their dark and murderous intent? In achieving success in eliminating terrorists in the valley, do we stop and reflect why the number of local recruits still keeps going up? There have been allegations of intelligence failure, but the ability to stop terrorist incidents and apprehending terrorists is most effective if the local populace is ready to provide intelligence that is relatively specific. This is possible only if there is a high level of trust and confidence between the populace and the security forces. This is becoming problematic as a result of intrusive and sometimes aggressive operations carried out by security forces who are also exposed to heightened risk. Collateral damage to innocent citizens caught in a cross-fire is difficult to avoid. Sometimes during security operations, houses belonging to innocent families may be blasted into ruins in order to ferret out terrorists who may have forcibly sought shelter. Even if the affected families are compensated, the loss and hurt lingers on. In my several visits to the valley while I was with the National Security Advisory Board, what came out loud and clear from civil society that one interacted with was a pervasive sense of injured dignity and loss of self respect that ordinary citizens felt as a consequence of prolonged security operations and disruption of day-to-day life. No insurgency can be dealt with if a population itself turns hostile and alienated. And there are signs of that beginning to happen in the valley. So while we must deal with cross-border terrorism and respond to Pakistan's hostile behaviour, we must not lose the trust and goodwill of the people of Kashmir in the process. In this context, attacks against Kashmiri students in several North Indian cities as also attacks on the person and property of ordinary Kashmiris pursuing their trade in different parts of India are particularly shameful and reprehensible. Such incidents can only exacerbate the sense of alienation among the Kashmiri people, in particular the Kashmiri youth. It is as if for some of our political figures and misguided youth, Kashmir is a piece of real estate over which we assert our claim, but the people there are dispensable. It is encouraging that the prime minister has spoken strongly against these attacks, but his sentiments do not seem to find resonance in other sections of the political class. Just think what a traumatic and bitter experience it would have been for those Kashmiri youth who have been subjected to abuse and assault and have had to flee back to Kashmir or seek shelter with sympathetic fellow citizens. It is claimed that these are isolated incidents and the numbers involved are not many. But each will be carrying horror stories to narrate to their families and friends and the circle of disaffection will spread. What one would have expected is an all-party statement condemning such attacks in the strongest possible terms and conveying a sense of reassurance to, and expressing solidarity with, Kashmiri youth and Kashmiris in general. It is also unfortunate that at a sensitive time there are rumours about an intended change in the Constitutional status of Jammu and Kashmir. The actions of the state government to induct appreciable numbers of additional security forces, the cancelling of leave of officials and putting hospitals on alert have fuelled these rumours. These have gained currency as they come in the wake of repeated calls for abrogating Article 35 A and Article 370 which grant a special status to the state and its people. The argument is that it is this special status which is at the root of the troubles which the Indian State is confronted with in the valley since it detracts from our assertion that the state is an integral part of the Indian Union. It is a fact that the Instrument of Accession signed by the then ruler of Kashmir was without conditions and the same as those signed by other princely states. However, the subsequent Constitutional and legal provisions are also a historical reality. The crisis in Kashmir is political and must be resolved politically. A change in its legal status will not make the problem go away. There could be a calculation that a 'nationalist' move to do away with these provisions may yield electoral dividends. Make no mistake that any cynical change in the legal status of Kashmir dispensing with democratic processes would lead to a very strong and negative popular reaction in the valley. There could be widespread violence and disaffection. Separatist sentiment will spread rather than diminish and we may be locked into a prolonged crisis where local violence and State repression escalate in a dangerous cycle. One hopes that better sense will prevail and precipitate action is avoided in an atmosphere already full of tension and apprehension. Those who are concerned about the future of this country need to reflect on the dangers that lie round the corner and sound a note of warning against rash and risky intentions. We are living in a time when ironically nationalism and national unity, both positive and laudable values, are being turned into instruments of threat and intimidation, to sweep aside warnings of dangers that lie ahead. These pressures must be resisted and citizens of this country must assert their rights as stakeholders in its future.